For the past several weeks, the "Ice Bucket Challenge" has been going on in real life. In this unusual fundraiser for ALS (Lou Gerigh's Disease), people record themselves announcing they're taking up the challenge and nominate three others to either take it or donate an amount to ALS research, then dump a bucket of ice water on top of their heads. Started on television, it soon went to social media and quickly went viral, inspiring a long list of personalities from politicians to businessmen to musicians and more to record themselves getting the cold water treatment. The event is not without it's critics, calling it gimmicky or a frivolous use of water. But the result has been the ALS Association receiving much more in donations. It was just a matter of time before the Ice Bucket Challenge came to Second Life. One place where one can take it is the SL Wrestling Community Building in the Alpha Centauri sim. Dropping by on Saturday August 23, Lilian Bombastic (lilian.stoneshield) was there, telling me, "you need to get the bucket near the sign but to be recorded we need to have out staff with the programs here to do it." A few moments later, Curt Bombastic appeared, "Hi Bixyl. Good to see you Again. Welcome to the SL Wrestling Community HQ." "So the Ice Bucket Challenge has come to Second Life?" I asked. Curt answered, "Yep. Debora Stine Creator of MUSCHI Fashions Created The Bucket and was good enough to put one here at the HQ. So far we've had people from all over come by, from the wrestling community, to the roleplay community, even members of the CFL." I asked, "About how many would you say have taken part?" Curt replied, "Oh ... lets see ... I'd say a good 50 to 70 people have come by so far and grabbed it and donated. We've even had some people come by and get recorded by Wildfire Productions in getting "iced" and issuing out challenges too. We put this up yesterday afternoon and already we've raised almost $7,000L as you can see. I think Its Great ... and I can't thank Debora Stine enough for coming over here and putting one out (laughter)." I mentioned the video by Tahisha Fairplay that I found (and would go up on the Newser the following day). Curt laughed, "Oh yes, I recall her. I thought that was cool and she had fun with hers. (laughter) We also added the 'I'm Freezing' animation that people can grab after they ice themselves. But all proceeds go directly to www.alsa.org, so it's been pretty good." I then asked Curt about any jokes about the event. He answered, "Oh there's been a few ... One person will be coming by later and putting on FRAZZLED hair after she ice's herself. One did it from the Titanic and got thrown into the water. Horses Morriesy instead of getting iced punt-kicked her mascot teddy bear into the sea. There's been some creative ones. As a community, we challenged the CFL Community and so far they've seem to respond in kind .... Its been fun so far." I then asked, "At this rate, how much do you expect to have raised?" Curt answered, "Good question ... I'm surprised at its only been up for a day and a half so far and we've raised the amount we have. We intend to keep this up for all of September and maybe even October and see where we go from here. But I heard that in real life, they reached the $50 million mark and I think Thats AMAZING ... This time last year they reached something like over 1 million and they've more than tripled obviously cuz of this .... It's pretty cool." "This has taken a life of its own. But the SL Wrestling community, oh hell, the SL community in general has really come out for this, so I think that its great. Next Month there are plans to host an ALS Charity Wrestling Event, maybe at APW Arena, or maybe here, still up for debate ... but it'll be a multi fed joint Super Event for ALS." I asked Curt how fast word seemed to be getting around. He answered, "Definitely. 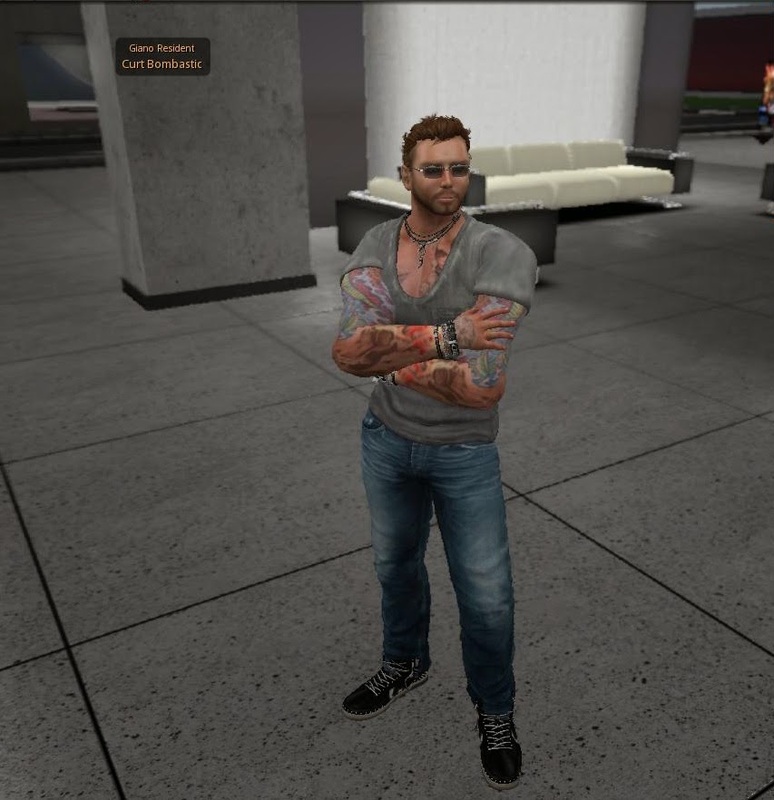 We've had people from the CFL, roleplaying communities, club goers, I saw a Linden here earlier as well ... Word is getting out there." "Oh? Which Linden was this?" I asked. "I don't know," Curt answered, "(I saw him) as I was logging out but the dot on the mini map was blue, so I knew it was a Linden. I never caught the name. I've been trying to find out." Curt then turned his attention to a lady who has written about wrestling a number of times, " By the way, tell Charlotte I'd LOVE to see her come on down and give the Ice Bucket Challenge a try too. She's MORE than welcome." He then laughed out loud, " ... The more the merrier I say. I recently challenged Zarrakan Productions as well. She has an office set up here. And I'd LOVE to see how Camera Kitty (as we call her) responds (laughter) ..... I challenged her last night at a VWE wrestling show ... so we'll see how she does this," he laughed again, "No doubt it'll be pretty good." "But yeah, this has been a lot of fun so far. We've been advertising outside of the Wrestling community and lots of people have shown up and tried or grabbed the bucket and donated which is GREAT. We Just opened the SL Pro Wrestling Community Headquarters two weeks ago, which I find is a great place here .... a place where we can promote the ENTIRE community to ALL of SL .... and this just helps I admit." Curt continued, "But its GREAT that the community has come together For a GREAT cause and its been a LOT of fun to do as well." "Anything else you want to mention about the challenge?" I asked. Curt thought for a moment, "Ummm ... other than we challenge the SL community to come on down, take the challenge. You can contact Lyra Phoenix on our staff board out front to get it recorded and donate. Let's spread awareness of this and hopefully find a cure for ALS." Curt told me he might have some more information on the charity event soon. He then told me he had to go, and we told each other goodbye and we went our separate ways. One can find the SL Wrestling Ice Bucket Challenge at Alpha Centauri (164/173/28). Whatever Happened to Intlibber Brautigan?